If you are looking for information on the Papa John's Pizza franchise business opportunity, Papa John's Pizzeria franchises or Papa John's franchising, then you have come to the right place. 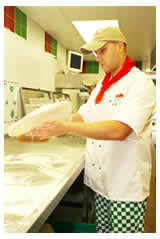 A world-class brand, Papa John's is one of the most exciting, fastest growing pizza companies in the USA. Founded in 1983 by John Schnatter, Papa John's has grown into an international operation with over 2,500 stores in the US alone. With annual system wide sales exceed $1 billion, it's time for you to share the secret of its success! It is no accident that Papa John's has been voted the best pizza in over 70 separate US surveys and named Best Pizza Chain in America in four consecutive years by the prestigious Restaurants & Institutions magazine. The reason is simple: commitment to using the highest quality ingredients to produce superior quality, traditional pizza. The only additional ingredient we need is the enthusiasm and drive of our franchisees. The prospects for the right people are excellent; particularly bearing in mind that home delivery is the fastest growing sector of the market. Pizza is universally popular and unaffected by seasons and trends. For our perfect pizzas, only the best will do. Ingredients must arrive in perfect condition at our stores, so we built a new centralized purchasing and delivery system to maintain and enhance product quality. A modern fleet of temperature - controlled trucks delivers the raw materials in the best condition and on time throughout the country. We also invest heavily in new technology and make every effort to ensure that we offer the very best service possible. Every new store is equipped with a state of the art computer system called PROFIT. Exclusive to Papa John's, PROFIT has been developed to help improve the efficiency of store operations and provides management reports as well as essential sales and marketing data. We also have a team of IT experts who are always on hand to help with any technical hiccups. A new national single telephone number now allows callers to ring from anywhere in the country and automatically be connected to their nearest store. An online ordering facility has been added to our website, providing customers with a quicker, easier and more efficient way of ordering. 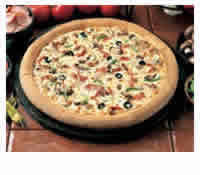 Ranked top pizza franchise by Entrepreneur magazine in 1999. Voted the best pizza in over 70 separate surveys in the USA . Ranked third largest pizza company in the world. The United States ' fastest growing pizza chain, opening 400 stores per year. Named Best Pizza Chain in America in four consecutive years (1997, 1998, 1999, 2000) by the prestigious Restaurants & Institutions magazine. Received the highest ratings amongst all national fast food restaurants in the 1999 Customer Satisfaction Index. Named Choice in Chains winner in the USA for three consecutive years. Founder and CEO John Schnatter named one of the ten outstanding young Americans for 2000 by the National Jaycees Organisation. Twice named UK Pizza Delivery/Takeaway Chain of the Year in 2000 and 2001 by the Pizza, Pasta and Italian Food Association. More than 70% of Papa John's restaurants worldwide are owned by franchisees, and they are central to the growth of and success of the brand, that's why we take care of them like they are family. From selecting the best sites and equipment to helping with training your team and marketing support, Papa John's assists its franchisees every step of the way. We operate company stores to ensure we fully understand the business and have a solid foundation for all aspects of training and retraining. They have proved invaluable for trying out new products and refining equipment, service techniques and marketing activity. Papa John's comprehensive training programs includes a week at the national training center and a week at a company store. In addition to this franchisees will benefit from up to two further weeks training for their staff in their own store. Marketing is a key facet of our approach and apart from activities to stimulate local demand, franchisees also benefit from ongoing national support in the form of major campaigns offering a combination of special price or package deals and competitions. In addition, we support each new Papa John's store opening with a comprehensive program of marketing and PR activity that has been designed to raise awareness of the store in the local area, encourage trial and repeat purchase. Finally, our experienced regional managers provide comprehensive operational back up. If you have a problem, they can help. Their knowledge and expertise can be called upon to assist with every day matters as well as helping you to recoup your investment many times over. Papa John's is always looking for committed, focused and enthusiastic franchisees who are hungry for success and willing to work hard with a hands-on approach.